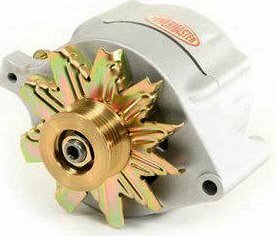 What alternator (brand, rating, etc.) would you recommend to replace the original? I need a bit more oomph as I am running more electronics (stereo, etc) and with a new battery it still does not seem to keep it charged. Well, first off, a stock Ford Mustang alternator replacement, typically has an output in the area of 40 to 50 amps. Higher output replacements hover around 80 amps. For example, Mr Gasket's higher output replacement is rated at 80 amps. Here's the one I like. It's a direct fit 1965 Ford Mustang Alternator made by Powermaster. At 140 amps, it's almost three times as powerful as a stock replacement, Nice too, it comes with a one year warranty and has a stock looking appearance. It should take everything that you can give it and then some. The link above has all the details and price. By the way...If you're not looking for something with a stock appearance, they also have a matte black version, rated at 140 amps. I chose a single wire alternator for my 65. It eliminates the need for external regulator and associated wires. It is simple to install, no modifications are required. Any auto electric shop can make one up, just tell them how many amps you would like, for about a c-note. Or you can pay more for an aftermaket type. It worked out so well i put one on my Ranchero. Thats a great tip. You get the simplicity of a one wire alternator system and a known good product with up to date parts and I assume a warranty.